Siege of a Mesopotamian city (Dutch Biblical Association). Mikko Kriek: I began my career in archaeology somewhere around 1993 at a crossroads moment in my life when I decided to switch to studying ancient history and archaeology. I was a very average student, but I did loads of fieldwork on archaeological projects throughout the course of my studies (mainly in the Mediterranean and the Middle East). It was on those excavations that I began to get comfortable with the graphic side of archaeology: site mapping, drawing archaeological findings, and even some reconstruction work. Everything was done with traditional drawing tools (i.e. pencil, pen, and ink). I got the hang of it eventually, slowly developing my skills in various techniques and slowly, but surely, introducing CAD drawing software and 3D applications. I noticed there was a niche for this kind of work, and I gradually began freelancing on top of being employed as a (digital) illustrator. Eventually that brought me to where I am now, partly employed by the commercial archaeological unit of the Free University of Amsterdam as an illustrator/graphic designer and partly employed by the archaeological department of the University of Amsterdam (we have two in this town, don’t ask me why) as a 3D illustrator and technician. Aside from that, I’m also a freelance illustrator working for my own company, BCL Archaeological Support. It’s in this capacity that I mainly produce historical and archaeological landscapes and architectural reconstruction illustrations for a host of international and domestic clients. 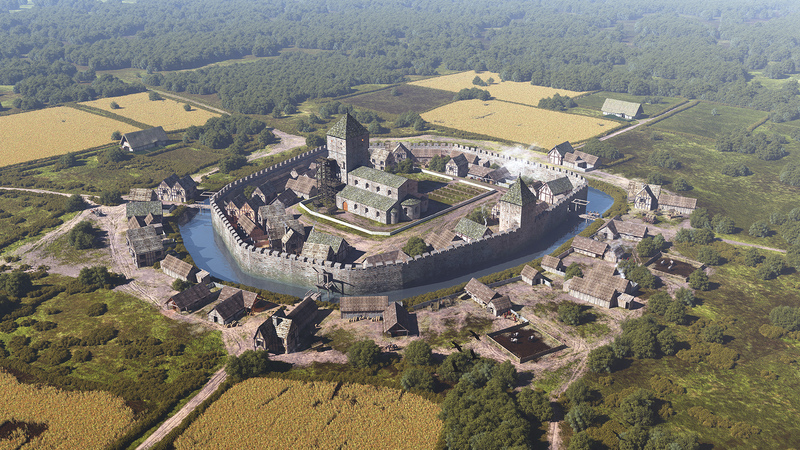 'Landsfort Herle', depiction of 14th century Heerlen, Netherlands (Heerlen municipality). MK: I think I have been using VUE for the last 11 years or something; I remember I had just gotten into more advanced 3D modelling and had been looking around for a way to do something more with my models (i.e. place them outside in their natural surroundings, give them some dramatic lighting, etc.). I looked around the internet and, by chance, stumbled upon VUE. I downloaded the free version and immediately got hooked on its easy interface and very powerful tools. It didn’t take long for me to upgrade and I have purchased every new update since. VUE has helped me a great deal in my career, it has given me the tools and the inspiration to improve myself on every commission. It is still the software where all my work comes together and what I generate my output with. VUE is partly responsible for the atmosphere and overall feel of my images. On every job, I try harder to achieve a realistic result, but I also try to construct a good image using color, lighting, and a sharp eye for a balanced composition. It’s those reasons why people know my work today and why clients come to me to have their projects visualized. Fectio, one of the oldest and biggest Roman military frontier camps at present day Vechten, Netherlands. Several of these fortified camps were scattered along the norther frontier (or Limes) of the Roman Empire from 2nd century onward (Limes Museum Project). e: What is your creative process like? How do you plan your projects? What other software do you use? MK: Mostly my creative process starts with a thorough brief, put together by several specialists involved in any given project. Since it all must be as scientifically accurate as possible, I can’t go around just making things up. From the architecture, landscape dynamics, vegetation, the position of the sun in the imagined time of day and year, etc., everything must be correct, so I need a healthy amount of background information to start off with. In my experience, experts involved are always very keen and enthusiastic to contribute their scientific knowledge to the project. It’s also good for their own train of thoughts and to refresh their approach for the stuff they excel at. In this light, I see making a good reconstruction image sometimes more as a team effort. When I have enough comprehensible background information, I begin working on the individual parts of an illustration. Any architecture or other objects I build are done in 3D Studio Max and for individual characters I use a combination of DAZ people with Marvelous Designer for clothing. The basis for my landscape is generated in World Machine, although I sometimes find it hard to get a thorough understanding of that piece of software. Eventually everything comes together in VUE where I generate the landscape using the World Machine output which I can then populate with my models and several ecosystems for vegetation. The final stages are getting the camera angle right as well as the atmospheric and light settings which may take days to complete. 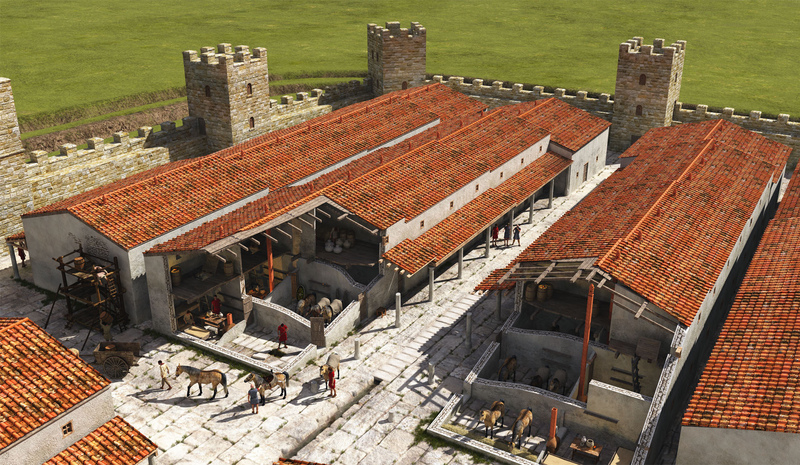 Cavalry barracks at Cilurnum (present day Chesters), a 2nd century Roman fort on Hadrians Wall in the north of England. Part of a series of images produced for a newly installed display (English Heritage). e: Are there any projects you’re currently working on with VUE and that you’re most proud of? What are some challenges you’ve faced, and how have you overcome them? I am proud of all my projects, but if there is a piece of work that I am particularly proud of it is the work I do for the English Heritage, a returning customer. It’s really satisfying to visit Hadrian’s Wall, one of the largest Roman UNESCO sites in Europe in the north of England and see my own artwork on their information displays at several site locations along the wall. As for challenges - at the moment I assist one of my colleagues at the University of Amsterdam who is developing a workflow for generating 3D point clouds and models using photogrammetry based on drone-photography. We developed a way of creating daily 3D recordings of the areas of excavations on several Mediterranean archaeological projects of the university. I tried to implement VUE in this process as well, with some satisfying results although it has proved to be a challenge to work with the very dense meshes that can be generated with photogrammetry (and other alternatives of 3D recording). This is still very much a work in progress and requires further experimenting. 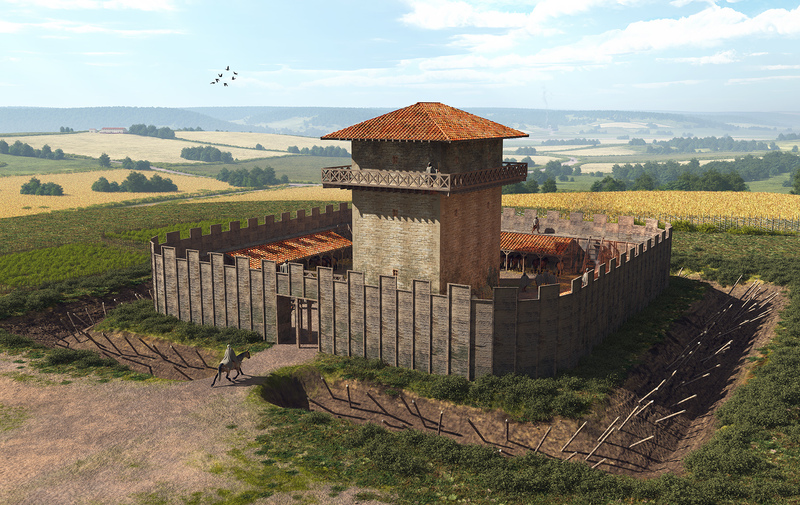 Roman Watchtower 'Goudsberg' near Valkenburg, Netherlands. Excavated evidence indicated remains of a tower structure erected in stone on this archaeological site from the Roman era. Even today the location commands an elevated view of the surrounding landscape (Valkenburg municipality). e: Have you used or tested PlantFactory yet? MK: Yes! On one commission, a few years back. For an exhibition in Germany I was asked if I could visualize a Devonian forest (approx. 300 million years old) based on quite detailed pencil drawings of locally found fossilized vegetation. I was panicking a bit on how to approach this project when I remembered I had recently purchased a copy of PlantFactory. After some fidgeting around, it turned out to be the perfect piece of software to use in producing accurate models of the prehistoric plants based on the sketches of the paleobotanist! Devonian forest. Depiction an approx. 300 million old 'forest'. Vegetation based on accurate drawings of fossilized remains, modeled in PlantFactory (LVR Landes Museum Bonn). MK: Being able to draw by hand and having an eye for detail and feeling for the dimensionality of things is an important skill to have as an archaeological illustrator. You must know how to translate an object (or area of excavation) into a drawing, filtering out any ‘noise’ and focusing on the correctly measured essential (man made) properties of whatever it is you are drawing. In this sense, a drawing is also an interpretation, making it much different than a photograph. 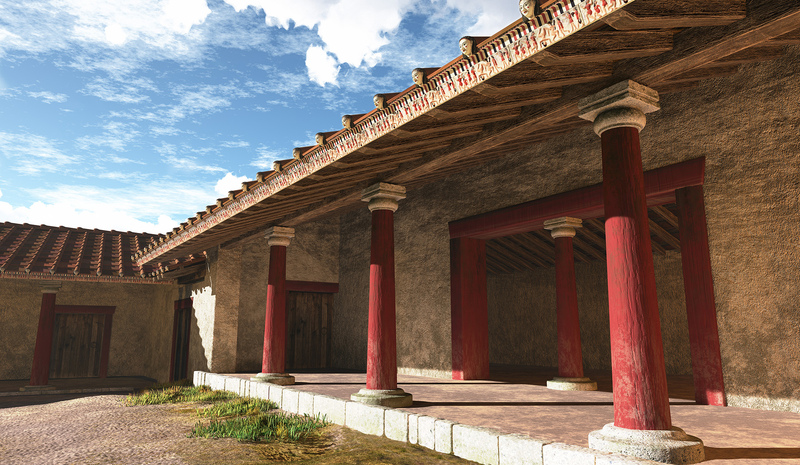 Reconstructed Etruscan houses (6th century B.C. ), Acquarossa, Italy. Reconstruction based on excavation archaeological data and finds (UvA Archaeology). e: What do you aspire to make in the years to come? MK: I aspire to make many more historical and archaeological visualizations; I really like to translate a story into an image as I believe that it’s a fantastic way to help the general public comprehend what science is trying to tell. Next to that, I am looking at ways to make my archaeological models work in things like virtual and augmented reality, but that is still very much a work in progress. Roman riverboats on the river Rhine. 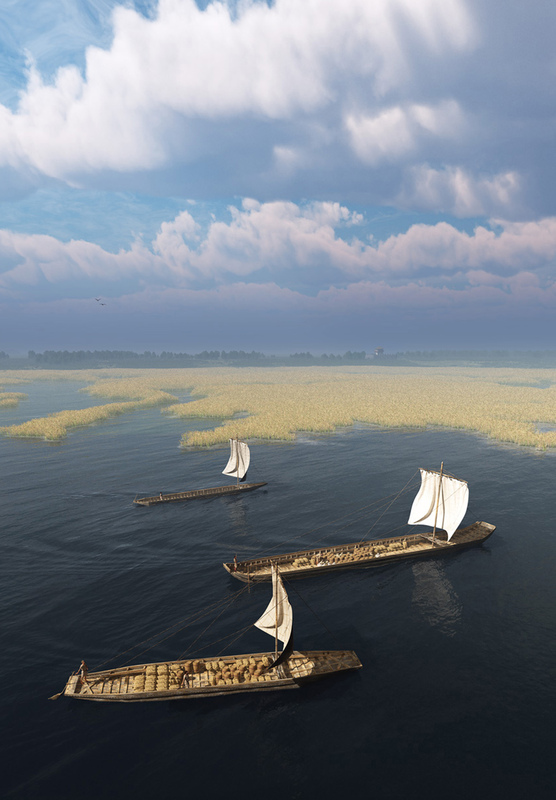 In the early seventies 6 riverbarges and canoes from the Roman era were excavated close to one another at Zwammerdam, Netherlands. 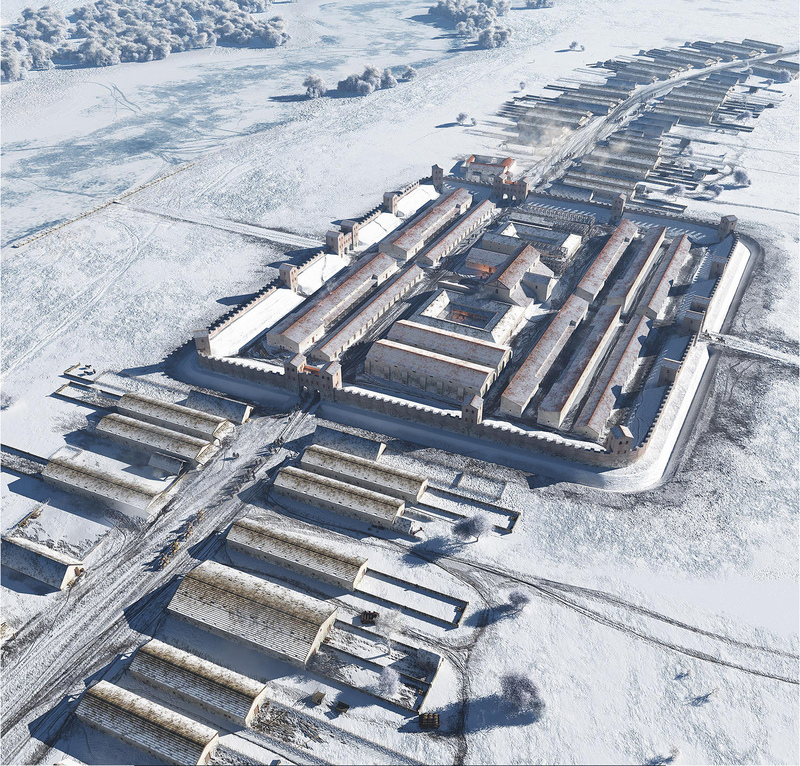 3 are reconstructed in this image (Hazenburg Archeologie).